On the literary quality of his films. I started out as a writer and then turned to film so a lot of people comment after watching my film that it’s more like a novel. I would say that’s the special character of my films. In creating my films I tend to reveal what I feel about my culture and what I feel about Korean life but I believe, moreorless, that my purpose is revealed in the films. On whether his film reflects religious hysteria in Korean society or simply one individual’s experience of grief. Rather than revealing the current culture of South Korea in my movie, I intended to show a personal experience perhaps involving all of us through the transformations of Shin-ae. Almost stereotypically as you experience the film, it begins as a melodrama, then becomes a thriller, and then it turns into a religious experience; however, I did not really intend to show literally the different phases of this particular woman but rather I wanted to show how all our lives go through a lot of unpredictable things and stages we do not expect. On the relationship to his actors and how he elicits their performances. I can’t exactly tell you how I’m different from other directors working with actors. Actually, I just leave them alone and let them do it by themselves. You may think this odd but, first of all, I recommend to actors that they have a sympathy and compassion for the characters they’re playing. What I tell them to do is to not act; do not try to act the character. I do not want actors in my films; I want characters. Not acting, being a character, is the most difficult thing to do. It’s very difficult to maintain principles and carry then out as characters believe they should. When I direct my film and also when I direct my actors, actors often feel neglected because I leave them alone and sometimes they worry whether they’re doing the right thing or not. The actress who played Shin-ae [Jeon Do-yeon], she had to understand the character she was playing and so she had to experience emotions; she had to understand perfectly and fully the emotions the character was going through. Nonetheless, as the director, I couldn’t teach her how to feel these thing and—because of that—she kind of hated me. 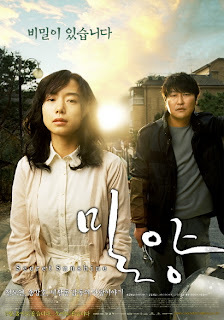 In the movie, the character Shin-ae later on in the film starts hating God and I think that hating somebody else in real life helped her act. There are a lot of elements in making a film but what I think most important is the character. Good films are determined by how the characters are played and how the characters are delivered to the audience through the acting of the actors. When you see a film, especially a good film, you will experience that the characters are being delivered to you live and honest and real and that is what I look for in my films. After seeing it Wednesday night, I'm reeling from this one. It's quite rare that I get teary-eyed at films these days but this one did it. Hope it gets distribution. I like what Lee has to say on "personal experience". Thanks for commenting, Brian. It truly is a great film, isn't it? How was his Q&A at the Letterman?